Intense moisture can be weightless. 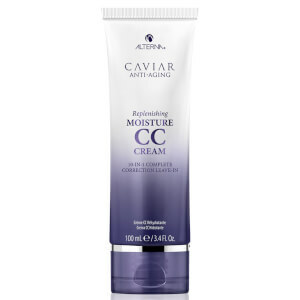 Alterna Caviar Anti-Aging Volume Conditioner infuses hair with strength and nourishment, without weighing hair down. The formula thickens and strengthens each strand with the anti-aging power of caviar, carrot and shea butter. For those who want intense nourishment and anti-aging benefits with added volume. Apply to wet hair. Rinse thoroughly. Seasilk, Caviar Age-Control Complex and volumizing proteins to give your hair exceptional volume with weightless moisture. Aqua/Water/EAU, Cetearyl Alcohol, Cyclopentasiloxane, Butylene Glycol, Stearamidopropyl Dimethylamine, Quaternium-91, Polysorbate 60, Cetrimonium Bromide, Cetrimonium Methosulfate, Panthenol, Wasabia Japonica Root Extract, Foeniculum Vulgare (Fennel) Seed Extract, Hydrolyzed Ulva Lactuca Extract, Hydrolyzed Algae Extract, Algae Extract, Caviar Extract, Linum Usitatissimum (Linseed) Seed Oil, Butyrospermum Parkii (Shea Butter), Saccharomyces Lysate Ferment, Saccharomyces Copper Ferment, Saccharomyces Zinc Ferment, Superoxide Dismutase, Lactoferrin, Daucus Carota Sativa (Carrot) Root Extract, Retinyl Palmitate, Phospholipids, Corn Oligosaccharides, Copper Lysl Oxidase, Acetyl Methionine, Acetyl Serine, Amino Acyl tRNA Synthetase, Phytosphingosine, Ganoderma Lucidum (Mushroom) Tyrosinase, Lentinus Edodes Tyrosinase, Glycine Soja (Soybean) Seed Peroxidase, Peptone, Hydrolyzed Soy Protein, Glycine Max (Soybean) Symbiosome Lysate, Pikea Robusta Extract, Adenosine Triphosphate, Niacinamide Polypeptide, Ascorbic Acid Polypeptide, Pantothenic Acid Polypeptide, Papain, Bromelain, Melanin Silanetriol, Glycoproteins, Hydroxypropyltrimonium Hydrolyzed Soy Protein, Hydrolyzed Oat Protein, Hydrolyzed Wheat Protein, Hydrolyzed Yeast Extract, Hydrolyzed Corn Protein, Hydrolyzed Vegetable Protein PG-Propyl Silanetriol, Guar Hydroxypropyltrimonium Chloride, Dimethiconol, Hydroxyethylcellulose, Polyquaternium-55, Polyquaternium-10, Quaternium-91, Amodimethicone, C11-15 Pareth-7, Laureth 9, Trideceth-12, Glycerin, Propylene Glycol, Disodium EDTA, Citric Acid, Parfum/ Fragrance, Methylparaben, Methylisothiazolinone, Methylchloroisothiazolinone, Geraniol, Hexyl Cinnamic Aldehyde, Limonene, Linalool. I purchased the Alterna shampoo and conditioner and I thought it was going to make my hair smooth. Well it dried it out and I am very unhappy with my purchase. If I could I would return for something else. I do not recommend this product. I got this conditioner to go along with Alterna Volumizing Shampoo (see my review). Using this conditioner with the shampoo and Alterna styling products has made my fine thin hair shiny, smooth, and manageable. It's like each strand has been thickened and my hair feels stronger. A little bit of this goes a long way. A dime size amount fully coats my shoulder length hair and a comb goes right through it with none of the tangles I usually have. I'm very pleased with this product and will buy again. A high quality, well-formulated conditioner (and shampoo) makes a huge difference. It's worth the cost. I had so many silver hairs taking over that I couldn't do my dark brown low lights and red highlights. It was apparent that I had to go to blonde highlights and Carmel low lights. Afterwards my hair was brittle and had a wired appearance. 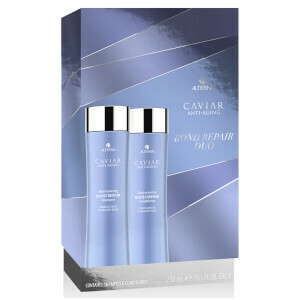 I tried the Alterna Caviar shampoo and conditioner after seeing it as...every menopausal women's best friend, on one of the morning talk shows. I thought why not give it a try? I'm so very glad that I had! After the first week, my hair felt healthy again. After a month of continued use, I started using it every other wash to maintain my hair's moisture level. I swear by this product. It does exactly what it states. Never would I imagine that a shampoo and conditioner would save me from the scissors. Love this stuff! It's more expensive than the other Alterna products (large size) but I like this one better for more fluffy, softer hair. Just good. It does exactly as it claims with no build up or sticky feeling.